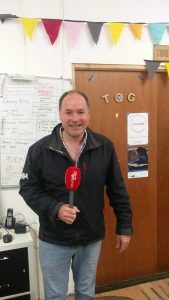 We had Henry McKean drop into Tog to see if he could get the famed Newstalk toaster fixed. He chatted with our members Jeffrey Roe & Louise Nolan about throwaway culture and the repair movement. You can check out the podcast of the interview below. This was written by tdr. Posted on Tuesday, November 20, 2018, at 6:08 pm. Filed under News. Bookmark the permalink. Follow comments here with the RSS feed. Post a comment or leave a trackback.